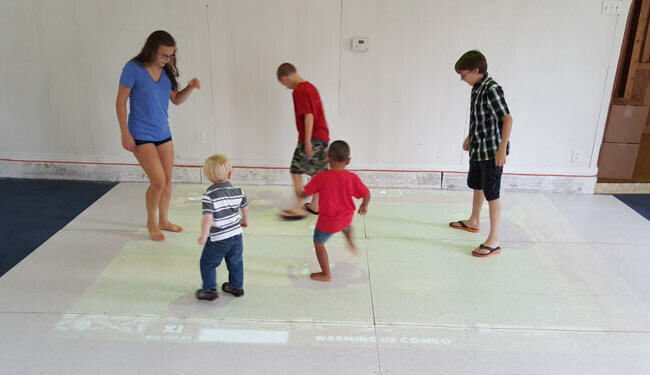 We interviewed Pastor Steve Rance, of Walnut Street Baptist Church of Lebanon, Indiana.Walnut Street Baptist Church has BEAM virtual playground installed, and we wanted to know how Steve uses BEAM to improve church attendance. BEAM: Can you tell a bit more about Walnut Street Baptist Church? Steve: We’re a small church. We average an attendance of between 45 and 65 people on a Sunday morning. We have a youth ministry with one teenager and about 25 regular attendees of grade school and middle school level. When we launched back in April, we took the old sanctuary, since there is a newer part of the building which we’re now using for a sanctuary, and refurbished it and turned it into a youth center. The first time I’d seen one of these systems was when my wife and I were serving as missionaries in Ghana, in West Africa. In the Accra Mall, in the capital city of Ghana, Accra, we were walking through this western-style mall, a very nice facility, and on the floor there were these shining fish, swimming around in the water with bubbles. And as you walked through, the fish would start to move and interact with you. Technology in Africa isn’t so advanced, so I was impressed by how high-tech this was. We got back to the states and I accepted a ministry at the Walnut Street Baptist Church. And when we were converting this youth center, BEAM interactive projection games system showed up on my Facebook wall. That’s how I made contact with you guys. It’s been fantastic. I’ve still got some improvements to do-I’ve got to get the rubber floor mat for a better playing surface-but I can tell you this. The age bracket is somewhere up to 12 or 13 years old, but we get the adults playing on it. They enjoy messing around with it as well. BEAM: What was the benefit you’d been looking to bring to the church when you got it? Steve: We were looking to use it for outreach, as an attraction to get children in the neighborhood a youth center with some variety. We had air hockey and games like that, but nothing at all for younger children, 3-5 year old. We wanted to give them some activity to do, and it’s done just that. It’s a draw, and as we advertise more, we will be able to use it as even more of a draw. As a matter of fact, on our launch, on our dedication Sunday, the mayor, Mayor Huck Lewis of Lebanon, Indiana, did the ribbon cutting for the youth center, and he was amazed that we had a system like this in our church in Lebanon. Steve: It’s been low maintenance!